The Founder of the company, Onorato Comitti, was a skilled Italian instrument maker who came to England in 1845. He sought a new future in the land that was enjoying unprecedented prosperity generated by the Industrial Revolution. Mr Comitti established his workshops in London as a maker of barometers and related instruments and in a very short time his beautiful products were gracing the homes of discerning customers. 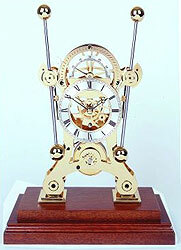 It was during the late Victorian period that the company diversified into clockmaking. Many of the styles made in these early days continue to be available today. 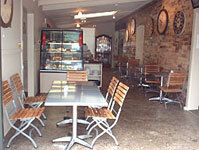 They are recognised as English classics and sought after as valuable antiques. A copy of an elegant timepiece originally made in France around the 1890s and thereafter made in various formats in England. The apparent simplicity of the design is achieved by omitting a wheel from the more conventional geartrain and making compensating changes in the tooth counts of the remaining gearing. The beauty of the clock is its simplicity. The 14 day movement is fusee-driven, gold plated and protected by a glass cover. Enamel finish dial and fine period hands. Availability is limited to 25 pieces worldwide annually. 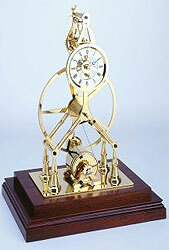 The Grasshopper Clock is based on the 'escapement' invented by the famous clock maker John Harrison (1693 - 1776). Harrison made the first marine chronometer that made it possible for seafarers to calculate their longitude position by observing the stars. The chronometer enabled them to compare the angle of their position with the known angle at a given time in Greenich, London. Examples of his work are exhibited at The Old Royal Observatory. The pendulums are inter-linked so that any motion to one would be compensated for by that same effect on the other. This was particularly important for the operation of such a clock subject to motion, for example the roll of a ship. A beautiful example of the clockmakers art. The 8 day movement is fusee-driven, gold plated and protected by a glass cover. The dials are etched and silver plated. The seconds are indicated by the 180 degree scale above the dial. Delicate period hands. Availability is limited to 25 pieces annually. A derivative of the Anglaise style. 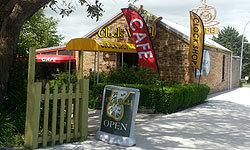 The Chatham is a superb copy of a Simon Willard tall clock circa. 1792. Simon Willard, born1753, was one of four sons, the fifth generation of the Willard family, all of whom were clockmakers and who at various times worked from the family home at Grafton which still exists. 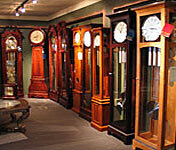 Between them they developed the unique "Roxbury style"of tall clock which is characterised by ogee or bracket feet, stop fluted quarter columns, rounded hood top with pierced fret work mounted between three chimneys each surmounted by brass finials. The Chatham incorporates these features and in addition we have added marquetry edge lining, cross-banding and corner quadrants to the solid mahogany case, to match the original clock, all of which are laid by hand. The cabinet is hand rubbed and waxed to achieve an antique mahogany finish with light distressing whilst all the furniture fittings are of solid brass. The moon-phase dial is a hand painted copy of a period dial originally produced in Boston and delicate milled hands indicate the time. The movement is of the finest quality, playing Westminster, St. Michael or Whittington melodies at will. It is cable driven and includes an automatic night silencer, chime sequence and automatic beat setting. This clock brings together the traditions and outstanding workmanship of this pre-eminent American clockmaker, skills which Comitti are proud to acknowledge and emulate, with quality modern clockwork to achieve a furniture item of outstanding character and presence.